Given the worldwide media coverage throughout Summer 2009 of pop icon Michael Jackson’s untimely death, most readers of all generations are familiar with his often-controversial father, Joe, and the Motown mogul, Berry Gordy, who helped catapult Michael and his brothers to stardom in 1969. Soul music fans will know who Curtis Mayfield is. But, it’s likely that lots of visitors to this blog asked themselves silently: “Who the heck is Clarence Burke?” This question helps make my point: Joe Jackson absolutely BigDOGGED Clarence Burke, Sr., the father of the attractive and talented Burke siblings of Chicago. Papa Clarence actually “got there first” in terms of packaging his children into a stunningly entertaining teenaged African American rhythm & blues vocal group. The Five Stairsteps were performing professionally in Chicago and around the Great Lakes states as early as 1965. At that time, they were far more popular and polished than the Jacksons, who started touring the Midwestern chitlin’ circuit a couple of years later. Joe Jackson definitely knew what Clarence Burke was doing in Chicago. From nearby Gary, Indiana, Jackson saw the “juicy steak” of a concept Burke had cut for his family: take five attractive African American teens, present them as the “young generation’s” answer to the Temptations and Sly and The Family Stone, stand back and watch the money pile up. A? Burke’s business plan included signing his children to Chicago soul music legend Curtis Mayfield’s Curtom/Buddah label. The Burke children so favorably impressed Mayfield that he even shared his songwriting genius with them, writing three of their bigger hits from 1968 to 1969. Ironically, the forgotten Five Stairsteps’ biggest hit, “O-o-h Child,” topped the Pop and R&B charts in late Spring 1970, long after it was obvious to anyone who cared that the Jackson Five had eclipsed them in terms of popularity and commercial success. It would be the Jacksons and not the Burkes who would forever be remembered as the superstar singing family from the Midwest. Here in the 21st Century’s second decade, perhaps a few million people (mostly African American baby boomers) remember the Five Stairsteps and still listen to their music. Arguably, a billion people worldwide know who the Jackson Five were and still buy their music. The forgotten five aren’t mentioned much. How did this happen? How did Papa Clarence’s oh so promising Five Stairsteps get BigDOGGED by Papa Joe’s Jackson Five, who as a group, were less talented? The answer can be summed up in four M’s: Motown, Marketing, Material and Michael. Motown. Curtis Mayfield’s Curtom/Buddah and Windy C labels were no match for Motown’s mighty distribution network. In the 1960s, African Americans across the country could buy Motown 45s in corner drugstores and neighborhood record shops as well as at Sears and other national department store chains. Joe Jackson’s best BigDOG move, business-wise, was getting his sons signed to Motown. There was no label hotter than Gordy’s in the late 1960s. Marketing. Gordy had a stable of marketing whizzes, chief among them was Suzanne de Passe. Once “I Want You Back” hit the charts in September 1969, the Motown squadron carpet-bombed the media outlets. Ms. De Passe generated “huge buzz” for the Gary, Indiana brothers. There were J-5 fan magazines, a J-5 Saturday morning cartoon show (only the Beatles had been so enshrined previously), J-5 posters and dolls. Gordy had seen the big money to be made by winning over the vast baby boomer “tween” market. Tweens had made The Archies, who were only a cartoon band, a Billboard Top 20 charting group in 1968. Gordy shrewdly marketed the J-5 not just to black kids, but to all kids, as a non-threatening “bubblegum soul” group, casting Michael as the peer hero for the pre-teens and Jermaine as the teen heartthrob for the girls. By the time the Jackson Five made their national television debut on The Ed Sullivan Show on December 14, 1969, they were firmly on their way to international stardom. Material. As gifted as he was, Curtis Mayfield was only one man. He could not match the firepower of the Motown songwriting “hit squad” tapped to mow down the competition for the Jackson Five. The Corporation, which included Freddie Perren , Deke Richards and Fonce Mizell, churned out irresistibly catchy songs that embellished Berry Gordy and Suzanne de Passe’s “bubblegum soul” brand. The lyrics of their songs, such as “The Love You Save” and “ABC” were squarely targeted at 5 to 15 year olds, but the arrangements and melodies had the bright energy of Sly’s best dance-oriented pop. Conversely, Curtis Mayfield gave the Five Stairsteps mature, worldy songs to sing: “Don’t Change Your Love” (a funky Chicago soul groove that still thrills) and “Baby Make Me Feel So Good” ( an aching surrender to love). 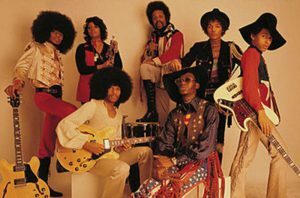 The Five Stairsteps, physically more attractive than the Jackson clan, didn’t play to the youth demographic that was theirs for the having. Joe Jackson and Berry Gordy were only too happy to take it from them. More children than parents were buying music in the late 1960s, albeit mostly with their parents’ money. Mayfield and Burke misfired by aiming the Stairsteps’ material at the adult soul music market and not the tweens. Michael. The recent remembrances by teachers of the young Michael Jackson have revealed that Michael had focused like a laser beam on being “a great entertainer” by the time he was 5 years old. When Michael was given the lead vocal role for the Jacksons around 1967, the word spread around the black communities of Chicagoland and the Great Lakes states of this “wonder child,” this “old soul” in a young boy’s body who could sing like Smoky Robinson and dance like James Brown. The Five Stairsteps tried to answer with Cubie, the youngest of the Burke brood. For a while, they even changed their touring name to the Five Stairsteps with Cubie. It was an impossible task they asked Cubie to achieve. No child entertainer of the era could compare to Michael Jackson. Many argue that Michael, in fact, was the greatest child entertainer of the entire 20th Century, greater than Shirley Temple, Judy Garland, Sammy Davis, Jr., or Frankie Lymon. This writer is among those who make that argument. So, there you have it. Joseph Jackson BigDOGGED Clarence Burke, Sr. to fortune and fame (fortune, maybe not so much, given the court decisions involving Michael’s estate). Joe BigDOGGED Clarence because Joe was shrewd enough to secure a Motown recording deal for his sons and blessed enough to have fathered a son he named Michael Joseph. Q. When Michael Jackson joined his four brothers as a performing group, they were not immediately known as the Jackson Five. What was their stage name before Joe Jackson changed it to the J5? Q. Cubie notwithstanding, what are the first names of Burke children who performed as the Five Stairsteps? A. Their names, eldest to youngest, are Alohe (pronounced “Aloha”), Clarence, Jr., James, Dennis and Kenneth. If someone is “punk’d” that means they are only publicly duped and embarrassed. If someone is “bigDOGGED” then that means a more ruthless Rottweiler or powerful pitbull of a competitor snatched away what they thought was theirs. The Forgotten Five.A? Did Joe Jackson and Berry Gordy BigDOG Clarence Burke, Jr. and Curtis Mayfield? Who do you think has been BigDOGGED like the forgotten Five Stairsteps in the music world, and by whom? If you’re interested in hearing 21st Century funk from the same Great Lakes region that was home to the Stairsteps and J5, logon to www.mune-pi.comA?to learn more about the latest release from SIDzCarbonatedMilk: The Mune-Pi Parables.